Primary Colours - These are colours that cannot be created through the mixing of other colours. They are colours in their own right. The three primary colours can be seen below RED - YELLOW - BLUE. Primary colours can be mixed together to produce SECONDARY COLOURS. The table below shows the combination required to produce secondary colours. 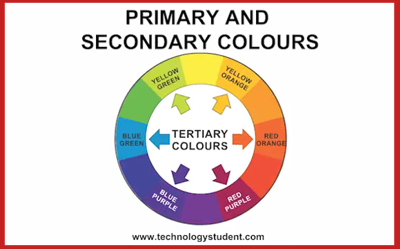 The colour wheel can be seen below and this can be used to help remember primary and secondary colours. The secondary colours are in between the primary colours - for example - between red and blue is purple. Quite simply, mixing the primary colours of red and blue paint together will produce the secondary colour purple. An important rule of the colour wheel is that colours opposite to each other on the colour wheel usually work well together as a colour scheme. These are known as COMPLEMENTARY COLOURS. Do you agree? 1. Try mixing yellow and blue paint together. What colour did they make? Was this what you expected? 2. Use purple and yellow paint alongside each other. Do think these complementary colours work well together? Explain your answer. 3. What are your favourite colours ? Why are they your favourite? 4. Ask 50 people at random the following question: 'What is your favourite colour'? Draw a pictogram to represent the results.